Donald Trump and I have something in common. We both currently hold the title President-Elect. Last night, Donald Trump was elected as the next President of the United States and will take office in January, 2017. I am the president-elect of the Massachusetts Collaborative Law Council (and will take office in March, 2017). Admittedly his election is a bigger deal, and also much more contentious than mine. That tension needs to be discussed, and I believe Collaborative Law can be instructive in how we make that conversation constructive instead of destructive. 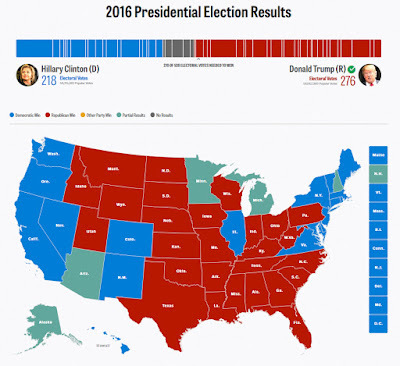 While all the votes are not counted yet (as of the time I am writing this - 9:10 AM EST on November 9, 2016), Donald Trump has won enough electoral votes to win the Presidential election. He will likely lose the popular vote, though practically speaking the difference is nominal (0.1286%). That means that our country is divided almost exactly in half when it comes to electing our President. That division creates strong feelings. There are many significant differences between Donald Trump and Hillary Clinton and between their political parties. They differ on domestic policy, foreign policy, economic policy, law enforcement policy... the list goes on. They also differ in personality, and speaking style, and personal history. You might wonder, how they can even be from the same country, nevermind the same state (currently). While this division in our country may feel shocking or heartbreaking to you, this actually sounds really familiar to me because I am a divorce attorney and mediator. Everyday I help couples transition their relationships to separate households and lives. Many of those couples walk in wondering how they ever married the person sitting next to them. They couldn't feel more different than they do right now. And yet, there is a history between them that is different than what sits in front of me on that day. Many couples choose to be in my office instead of going to court because there is some part of them that recognizes that a thread of connection remains. Often that connection is their children, but even couples without children may choose a collaborative or mediated divorce because they respect the relationship they once had, even if they have difficulty respecting each other currently. When divorcing couples have children together they will have an ongoing relationship, and that relationship, while different than a marriage, is an important one. The quality of that relationship will determine what kind of households their children live in, whether their children live in fear or hope, whether their children feel like they have a place or places they can call home, and whether their children feel like they have the support and confidence necessary to succeed in their own relationships. But that doesn't mean it's easy to define that relationship. Many divorcing couples with children face a very hard task, because in that moment of divorcing they feel farther away from their spouse than they ever have before. They feel divided and that feeling is not just understandable, it's expected. Collaboration and Mediation techniques help divorcing couples build a new relationship from the loss of their old one by focusing on the interests and goals that each of the people have, many of which will overlap. The reason this process works better than the adversarial court model at building strong co-parenting relationships between divorced spouses is specifically because of this focus on interests and goals. Interests and goals connect people, while adversarial positions divide them. Knowing that you want a safe and affordable place to live is not something I can argue with, even if I disagree on whether you should get to keep the house we own together. The hard work is in helping scared, and sometimes angry, people express their goals and interests before taking positions, in finding understanding before evaluating options, and in encouraging open communication throughout that process. Donald Trump and his supporters may rejoice in his election and the confidence that half the country has shown in him. At the same time, much of the country feels heartbroken because they feel that his message and his policies are an attack on and endanger their way of life. If we simply take positions and call each other names then the fighting will continue, the governing of the country will continue to be obstructed by half of the people, and in 4 years we will have another election where half the country feels vindicated and half the country grieves. Just like we expect divorcing spouses to experience the stages of grief as they mourn the loss of their relationship, I expect Hillary Clinton supporters to be despondent today. They will likely feel denial, anger, bargaining, depression and acceptance, separately, overwhelmingly, and sometimes all at once. Donald's supporters may be feeling positive today, but that feeling won't last forever either. Winning the election is not a win if half the country fights everything you try to accomplish and spends 4 years deciding how to undo your accomplishments as soon as they get back in power. That is not long-term change or hope, it's simply trading the baby back and forth every 4 or 8 years. Without real change in how we problem solve, that is exactly what we are poised to do. When the dust settles, however, it is possible that we can break the cycle of division in this country by looking below the surface and recognizing that we have shared interests, just as we do in a Collaborative Divorce case when we try to prevent people from repeating past cycles of division and tension. Both Donald Trump and Hillary Clinton supporters want economic security, safety for their family and friends, and the opportunity to succeed. Both sides often blame the other for keeping them from achieving those goals. The history of this country (and the world) has many examples where that is plainly true; groups often oppress those they see as different in the belief that by stepping on the backs of others they will rise up themselves. But it always fails eventually. The oppressed will never let you stand on their backs forever. So why do we repeat that model, and why do we spend so much time trying to prove that the other side is focused only on that model? It is not a constructive endeavor but it is a convenient shortcut to temporary power. But there is another way. The United States was built on ideals that constantly fight back against that basest of human tendencies. We declared that the interests of all men are self-evident and eventually we declared the same for women. Now we have to Live Up to that Declaration. We have to ask how the interests of Trump supporters and Clinton supporters can simultaneously rise up together. How can we all prosper more, without it being at the cost of the others? We have to stop falling into the trap of believing that there is "us" and "them". Trump's America and Clinton's America are not two separate Americas. Both sides have an obligation to make America greater. In deciding how we do that together, we can think about the similarities between the role of citizen and the role of parent. We have a relationship as fellow citizens, whether we like each other or not, and if we don't work together, our country, our children, our legacy will fail in life and falter. Once the hangover of the election wears off, you still have a choice to make. Each and every person in the United States of America has a choice. You can be angry or depressed: fight and be divided, rant on facebook against "the others", expressing your fears and anxiety over the direction of the country. OR you can DEMAND better, of your Country and Yourself. You can stop yourself from name-calling and you can write and call your elected representatives when you see them do it. You can reach across the aisle to those who hold different expressed politics than you, and have lunch with them. Don't just start a dialogue online and think that you've tried. Real dialogue requires engagement, body language, tone of voice, and commitment to problem solving. Online dialogue is too easy to walk away from, and it's too common to misconstrue the tone of a post. If you want to be the change you want to see in the world, you have to live the act of peaceful problem solving daily. Educate yourself about effective dialogue and problem solving and make a conscious effort to catch yourself when you resort to labelling (and using "you" vs. "I" statements). If you're convinced that you hold the moral high-ground, then you're focused on what's wrong with the other side rather than how you can improve the conversation. Ultimately you control your actions and not the actions of others, but as I tell my divorcing clients constantly: if you don't take the action that is in your control, then you cannot expect better from the other side. I am not exempt from any of these trappings either. I spent the night and early morning depressed about the results of the election. I am afraid of where our country may be headed, but I also believe that there is still a chance to heal and for good to come out of any situation. I don't believe that the office of the President of the United States nor the person who currently holds that office has control over my (or your) opportunity. If you want to have lunch with me to discuss further how Collaborative problem solving works, regardless of where you stand politically, please feel free to reach out to me at jkelsey@skylarklaw.com. Thank you so very much for this post, Justin. On this most heart-breaking of days I am grieving deeply for my country and my community, and embarking on the hardest work of my line--to respond with love and skill to the hate and desperation that appears to be at the nub of our collective nightmare. If I can see others as having the same hopes and fears as I, I will be hastened in that work. Your reminders are so important in demanding better of myself and my country.